I have mentioned before that we’ve all migrated towards having exactly the same gear as we observe on each outing whose stuff works a little better. On the KTM 500 I saved space with a NEMO bivy but this year I’m pleased to be back in the brother-standard Half Dome tent. 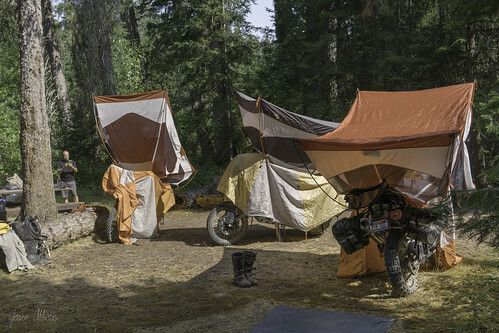 It is Jeremy who has the clever idea to dry the tent’s bottom the next morning by cradling it upside-down on our motorcycle seat and handlebars. Now we’re hoping people drive by so we can baffle them with the spectacle.